Billy Hamilton has long been touted as an elite prospect, but his Major League call-up to the Cincinnati Reds roster and thrilling play has revitalized interest in his cards and has collectors salivating. His stealing ability, in particular, has gotten him major recognition and he stole four bases in his very first Major League game. As the Reds close in on the playoffs, look for Billy Hamilton cards to start moving. Shop for Billy Hamilton cards on eBay. A multi-sport athlete, Billy Hamilton could have pursued a college football career as a wide receiver. However, he was drafted in the second round of the 2009 MLB Draft and joined the Cincinnati Reds organization. A great all-around player, Hamilton quickly distinguished himself with his quickness on the base path. He stole a minor league single-season record 155 bases during the 2012 season. Although he was originally drafted and used as a shortstop, the Reds moved Hamilton to center field in 2012. Blly Hamilton was called up in early-September of 2013, and got his first work as a pinch runner. He soon got his first start and appears to have made a quick transition to the MLB. 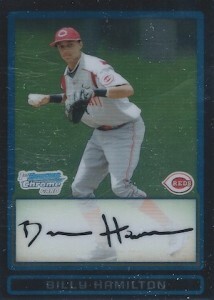 Given his recent call-up, there are currently no official rookie cards for Billy Hamilton. However, several popular prospect cards are available and are detailed below. His very first card and the most popular non-signed option, Billy Hamilton's Bowman Chrome Draft Prospects card is a great budget option for collectors. Multiple numbered parallels offer higher values and there is also a a base non-Chrome version of the card. 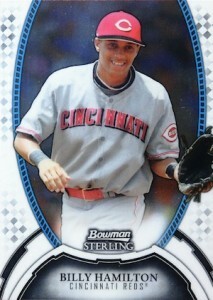 Another base option for collectors, 2011 Bowman Sterling showcases a larger image of the young Reds prospect. Again, parallels add to the chase. Easily his most sought-after prospect card, 2012 Bowman Chrome is among the best autographed options. The on-card signature and Bowman Chrome name set this card apart. 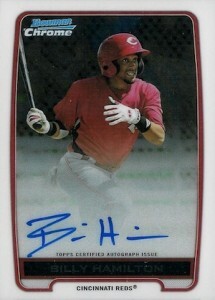 Also from 2012, Bowman Sterling represents a more budget-friendly autographed card for Billy Hamilton. The horizontal layout and on-card signature combine for an appealing look. One negative would be that the blue ink and blue background are not the most desirable pairing.